The Isle of Man Railway inherited four covered ventilated vans of a different design from the Manx Northern Railway in 1904 and built a further five longer-body examples itself between 1915 and 1921 using redundant chassis from original 4-wheel carriage stock. Numbers G1, G3, G5, G8 available. Orders will be packed randomly with no two the same unless more than four are ordered. 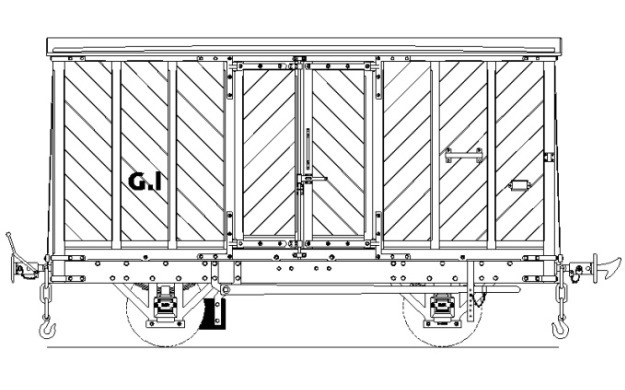 Based on the very accurate Ashbury chassis first developed for the two plank IoM ‘M’ wagons these vans include spoked wheels and scale couplings to give a very accurate prototypical model.